"They're cutting in line! They're BARBARIANS!" The people at Big Idea have had great success in the past with VeggieTales, their computer-animated video series about talking fruits and veggies who have all sorts of whacky adventures (all of which have, at their center, a Biblically-based moral message). Though the series is of Christian origin, the lessons are fairly non-denominational, focusing on overall virtues like telling the truth and the Golden Rule�certainly things that any family would encourage. 3-2-1 Penguins! is the latest offering from Big Idea, and the formula is pretty much the same. Twins Jason and Michelle are visiting their stodgy old grandma while their parents are away, and to alleviate boredom, they explore the attic. The two discover a telescope, and fight a bit about who will use it first. When his sister wins out, Jason lets his imagination run away with him. He's suddenly visited by four tiny penguins in a spaceship (these guys look very similar to the ceramic penguins grandma keeps on her shelf). It's Zidgel, Midgel, Fidgel, and... Kevin, four flightless birds on an intergalactic mission. They whisk Jason off to Planet Wait-Your-Turn, which is in danger�it seems the entire population has been infected by the cutting-in-line bug, and it's causing the planet to break orbit and move first in line from the sun! The moral of the story is pretty clear from the get-go, and I wouldn't say it's communicated subtly, what with grandma quoting "the good book" and Jason saving the planet with his own little breakthrough. But the series is aimed at young children, so the forthrightness is to be expected. The real charm is in the details�3-2-1 Penguins! is refreshingly original through and through. For example, for no reason at all, the inhabitants of Planet Wait-Your-Turn are all vacuum cleaners with bug eyes (and mustaches made out of hose attachments). And there's a nice balance of goofiness and sight gags for the kids (the dim-witted Kevin getting sucked into a vacuum) and more tongue-in-cheek humor for the parents (the leader of the planet is President No-I'm-the-President). The characters all have their own amusing quirks (Zidgel is a parody of the typical know-it-all captain, though he's also kind of an idiot), and the characterization of the twins is spot-on, particularly when they're bickering. The animation, from the designs to the rendering, is even more ambitious and impressive than on VeggieTales�with the first big-screen Big Idea movie right around the corner (Jonah: A VeggieTales Movie), I think we can expect the quality of animation to continue to improve. 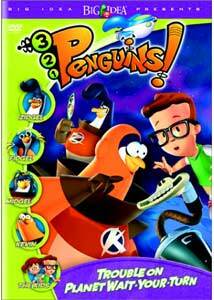 If you're a fan of Big Idea, you'll be perfectly happy with 3-2-1 Penguins!. If you're simply looking for an educational program to entertain the kids, this one comes highly recommended. It's one of the best shows of its kind. Why didn't I ever get to watch cool cartoons in Sunday School? Image Transfer Review: It's easy for CGI to look great on DVD; 3-2-1 Penguins! is no exception. Colors are quite bright and eye-catching, with nice solid blacks. I noticed no compression artifacts and just a touch of aliasing in the opening shot (of a car grille). Very nice�I suspect it was done straight from the digital source. Audio Transfer Review: This 5.1 mix is decent, considering the material. It's fairly front-heavy, with dialogue clear and anchored in the center channel. The front soundstage features some nice directionality, especially during the zippy space scenes, and the surrounds offer some support for the score (and occasionally a touch of atmosphere as well, once again in the outer space scenes�no pun intended). Extras Review: Big Idea has packed this DVD with quite a few extras, but none of them go much into the actual production of the series. The focus, rather, is on fun games and clips for kiddies (which is ok, considering the target audience). The features are broken down into two sections, Production and Hey Kids!. Selecting the former will takes you to a separate menu with several options to choose from. Two "How to Draw" featurettes, one for Zidgel and one for the Penguins' ship, run about 2 minutes each. You'll not likely actually learn to draw anything by watching these clips, but they're still kind of neat. A Concept Art gallery offers a few screens of rough sketches and a nice peek at some alternate character designs. The Penguin Progression Reel is basically a storyboard-to-final animation comparison, with both images running in split-screen. Family Fun Activity runs for about three minutes and outlines the rules for a very simple game that parents can play with their kids to reinforce the show's theme of patience ("game" makes it sound far more fun than this actually looks). 3-2-1 Bios! is a collection of tongue-in-cheek character descriptions for the four penguins, narrated by Midgel. The audio commentary features director Ron Smith and the four penguins, in character. It's a bit of a disappointment. Smith hardly talks at all, and the penguins merely offer lame MST3Kstyle comments as they watch�pretty uninspired. I would much prefer a talk with the series' creators, discussing development and animation techniques, etcetera. Hey Kids! houses the kid-friendly extras (not that the regular extras are all that sophisticated). First up are a number of interactive games. 3-2-1 Trivia! is made up of ten multiple choice questions about this disc's episode. Answering them all correctly will net you a brief clip explaining a bit about real-life penguins. The Space Maze! (all these exclamation points make everything so much more exciting!) can be navigated with your remote. I don't get why Hide & Seek is supposed to be fun. Kevin hides behind an object in the living room, and you click various things until you uncover him. Both times I played it, he was behind the final remaining item, which just goes to show that things are always in the last place you look. There's a karaoke version of the song The Shinin' Star Swing (from the episode Carnival of Complaining), as well as a storybook version of the next episode, The Cheating Scales of Bullamanka. Space Academy School (Course 101) teaches kids a pneumonic device to remember the planets. Finally, if your kids need more sugar, they can help you bake some Delicious Deep-Space Dust Bunnies, which include such exotic ingredients as marshmallows and food coloring. A 5-minute featurette outlines all the steps. A promotional gallery features spots for other Big Idea releases, including Heroes of the Bible, Jonah: A VeggieTales Movie, LarryBoy, 3-2-1 Penguins! : The Cheating Scales of Bullamanka, and 3-2-1 Penguins! : Carnival of Complaining. And on the DVD-ROM side, we've got a coloring book that can be printed out and the complete script, in rich-text format. 3-2-1 Penguins! is another fun series from the folks at Big Idea, and, dare I say it, it's even more inventive than VeggieTales. Where else can your children learn virtue and morality from a bunch of talking penguins and a vacuum cleaner? Great AV quality and extras, too.